For other uses, see Burrito (disambiguation). A burrito (US English /bəˈritoʊ/, buˈrito ) is a type of Mexican and Tex-Mex food, consisting of a large wheat flour tortilla with a filling, wrapped into a closed-ended cylinder, in contrast to a taco, where the tortilla is simply folded around the filling. The flour tortilla is sometimes lightly grilled or steamed to soften it, make it more pliable and allow it to adhere to itself when wrapped. In Mexico, meat and refried beans are sometimes the only fillings. In the United States, burrito fillings may include a combination of ingredients such as Mexican-style rice or plain rice, beans or refried beans, lettuce, salsa, meat, guacamole, cheese, sour cream and various vegetables. Burrito size varies. The word "burrito" appears in the Dictionary of Mexicanisms from 1895. 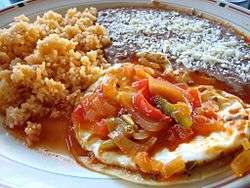 It is the term used in the regional area of Guanajuato to describe a "Tortilla rolled, with meat or other food within, that in Yucatan is known as coçito, and Cuernavaca and Mexico, as taco." Having been published in 1895, this fact discredits the etymology that notes the origin of the "burrito" during the Mexican Revolution (1910-1921) in the City of Cuidad Juarez by Juan Méndez. In other regions of Mexico such as in the state of Tamaulipas, similar types of food are known as "flauta" (flute). Before the development of the modern burrito, the Mesoamerican peoples of Mexico used corn tortillas to wrap foods, with fillings of chili peppers, tomatoes, mushrooms, squash, and avocados. The Pueblo people of the Southwestern United States also made tortillas with beans and meat sauce fillings prepared much like the modern burrito. The precise origin of the modern burrito is not known. However, it is generally believed to have originated in the Mexican-American community. Some have speculated that it may have originated with vaqueros in northern Mexico in the nineteenth century. Many have traced its roots to the farmworkers of the fields in California's Central Valley, in Fresno and Stockton. Farmworkers that picked many of the Central Valley's agriculture would prepare lunches in the fields consisting of homemade flour tortillas, beans and salsa picante or hot sauce. Other farmworkers would prepare their burritos at home and wrap them in foil wrap and place them in the sun so they could warm up. In the 1895 Diccionario de Mexicanismos, the burrito was identified as a regional item from Guanajuato and defined as "Tortilla arrollada, con carne u otra cosa dentro, que en Yucatán llaman coçito, y en Cuernavaca y en Mexico, taco" (A rolled tortilla with meat or other ingredients inside, called 'coçito' in Yucatán and 'taco' in the city of Cuernavaca and in Mexico City). An often-repeated folk history is that of a man named Juan Méndez who sold tacos in a street stand in the Bella Vista neighborhood of Ciudad Juárez, using a donkey as a transport for himself and the food, during the Mexican Revolution period (1910–1921). To keep the food warm, Méndez wrapped it in large homemade flour tortillas underneath a small tablecloth. As the "food of the burrito" (i.e., "food of the little donkey") grew in popularity, "burrito" was eventually adopted as the name for these large tacos. Another creation story comes from 1940s Ciudad Juárez, where a street food vendor created the tortilla-wrapped food to sell to poor children at a state-run middle school. The vendor would call the children his burritos, as burro is a colloquial term for dunce or dullard. Eventually, the derogatory or endearing term for the children was transferred to the food they ate. Burritos are a traditional food of Ciudad Juárez, a city in the northern Mexican state of Chihuahua, where people buy them at restaurants and roadside stands. Northern Mexican border towns like Villa Ahumada have an established reputation for serving burritos. Authentic Mexican burritos are usually small and thin, with flour tortillas containing only one or two ingredients: some form of meat or fish, potatoes, rice, beans, asadero cheese, chile rajas, or chile relleno. Other types of ingredients may include barbacoa, mole, refried beans and cheese, and deshebrada (shredded slow-cooked flank steak). The deshebrada burrito also has a variation with chile colorado (mild to moderately hot) and salsa verde (very hot). The Mexican burrito may be a northern variation of the traditional taco de Canasta, which is eaten for breakfast, lunch, and dinner. Although burritos are one of the most popular examples of Mexican cuisine outside of Mexico, in Mexico they are only popular in the northern part of the country. However, they are beginning to appear in some nontraditional venues in other parts of Mexico. Wheat flour tortillas used in burritos are now often seen throughout much of Mexico (possibly due to these areas being less than optimal for growing maize), despite at one time being particular to northwestern Mexico, the Southwestern US Mexican American community, and Pueblo Indian tribes. Burritos are commonly called tacos de harina (wheat flour tacos) in central and southern Mexico and burritas (feminine variation, with 'a') in northern-style restaurants outside of northern Mexico proper. A long and thin fried burrito similar to a chimichanga is prepared in the state of Sonora and vicinity, and is called a chivichanga. The origins of the Mission burrito can be traced back to Mission District taquerías of the 1960s and 1970s. 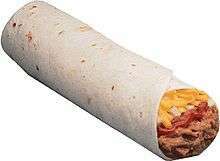 This type of burrito is produced on a steam table assembly line, characterized by a large stuffed tortilla, wrapped in aluminum foil, which may include fillings such as carne asada (beef), Mexican style rice, whole beans (non refried), sour cream and onion. Febronio Ontiveros claims to have offered the first retail burrito in San Francisco at El Faro (The Lighthouse) in 1961, a corner grocery store on Folsom Street. Ontiveros claims credit for inventing the "super burrito" style leading to the early development of the "San Francisco style". This innovation involved adding rice, sour cream and guacamole to the standard meat, bean and cheese burrito. The Mission burrito emerged as a regional culinary movement during the 1970s and 1980s. The popularity of San Francisco-style burritos has grown locally, with Mission Street taquerias like El Farolito, and nationally with chains such as New York's Dos Toros, Chipotle Mexican Grill, Illegal Pete's, Freebirds World Burrito, Qdoba, and Barberitos. In 1995, World Wrapps opened in San Francisco's Marina District, bringing a burrito-inspired wrap style to the restaurant industry. The California burrito originated at an unknown -berto's named restaurant in San Diego in the 1980s. :165, 168 Another claimant of originator of the California burrito is the Fresh MXN chain (formerly Santana's). The earliest-known published mention was in a 1995 article in the Albuquerque Tribune. 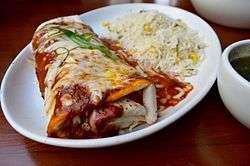 The California burrito typically consists of chunks of carne asada meat, French fries, cheese, and either cilantro, pico de gallo, sour cream, onion, or guacamole (or some combination of these five). :153 The ingredients are similar to those used in the carne asada fries dish, and it is considered a staple of the local cuisine of San Diego. With its merging of French fries with more traditional burrito fillings, the California burrito is an example of fusion border food. The California burrito has also been described as a "trans-class" food item, as it is regularly consumed by people across socio-economic lines. 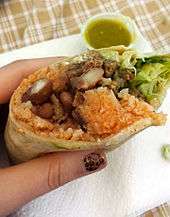 Variants of this burrito add shrimp (surf and turf), or substitute carnitas or chicken for carne asada. The carne asada burrito is considered a regional food of San Diego. It has been said that to San Diegans, "carne asada burritos are as integral to the experience of the place as a slice of pie is to a New Yorker." The San-Diego style carne asada burrito is served with chunks of carne asada, guacamole, and pico de gallo salsa. This "wall-to-wall" use of meat contrasts to other burrito styles, which use rice and beans as filler ingredients. Los Angeles also has several unique local burrito varieties. The first is the most traditional, and is exemplified by the versions at Mexican-American restaurants such as Al & Bea's, Lupe's #2, and Burrito King. These restaurants have often been in existence for decades and offer a distinctly Americanized menu compared with the typical taqueria. The burrito itself can take multiple forms, but is almost always dominated by some combination of refried beans, meat (often stewed beef or chili), and cheese (usually cheddar), with rice and other typical Mission burrito ingredients offered as add-ons if at all. The most basic variant of this burrito consists of only beans and cheese; beyond this there are the "green chile" and "red chile" burritos, which may simply mean the addition of chiles or a meatless chile sauce to the plain beans (as at Al & Bea's), or meat and/or cheese as well. Rice, again, is rarely included, which along with the choice of chiles is one of the style's most defining traits. The menu will then usually go on to list multiple other combinations, such as beef and bean, all-beef, a "special" with further ingredients, etc. If the restaurant also offers hamburgers and sandwiches it may sell a burrito version of one or more of these, such as a hot dog burrito. In addition to the former variety, Los Angeles is also home to three burrito styles that can be said to fall under the category of Mexican fusion cuisine. The first is the famed "kosher burrito," served since 1946 at its eponymous restaurant at 1st Street and Main in Downtown Los Angeles. Another is the kogi burrito, invented by Roy Choi, the first chef to combine Mexican and Korean cuisines. The kogi burrito was named the seventh best burrito in Los Angeles in 2012 by the LA Weekly. Of Choi's creations, accented with chile-soy vinaigrette, sesame oil, and fresh lime juice, food writer Cathy Chaplin has said that "this is what Los Angeles tastes like." Finally there is the sushi burrito, most notably the version sold at the Jogasaki food truck. Wrapped in flour tortillas, sushi burritos include such fillings as spicy tuna, tempura, and cucumber. The existence of such a large Mexican community in Los Angeles also makes it possible to find a wide variety of authentic burrito varieties from various regions of Mexico, from Oaxacan to Hidalguense. The breakfast burrito, a variety of American breakfast, is composed of breakfast items – particularly scrambled eggs – wrapped inside a flour tortilla. This style was invented and popularized in several regional American cuisines, most notably New Mexican cuisine, Southwestern cuisine, and Tex-Mex. 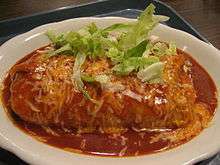 A wet burrito is covered with a red chili sauce similar to enchilada sauce with melted shredded cheese on top. It is usually eaten off a plate with a knife and fork, rather than hand held. This variety is sometimes called "smothered", "enchilada style", "mojado" (Spanish for "wet"), or "suizo" ("Swiss", an adjective used in Spanish to indicate dishes topped with cheese or cream). The Beltine Bar in Grand Rapids, Michigan is said to have introduced the wet burrito in 1966. A burrito bowl is not technically a burrito, as it consists of burrito fillings served without the tortilla, with the fillings placed in a bowl, and a layer of rice at the bottom. It is not to be confused with a taco salad, which has a foundation of lettuce inside a fried tortilla. A chimichanga is a deep-fried burrito popular in Southwestern and Tex-Mex cuisines, and in the Mexican states of Sinaloa and Sonora. Taco Bell research chef Anne Albertine experimented with grilling burritos to enhance portability. This grilling technique allowed large burritos to remain sealed without spilling their contents. This is a well-known cooking technique used by some San Francisco taquerias and Northern Mexico burrito stands. Traditionally, grilled burritos are cooked on a comal (griddle). Bean burritos, which are high in protein and low in saturated fat, have been touted for their health benefits. Black bean burritos are also a good source of dietary fiber and phytochemicals. ↑ Bayless, Rick; Bayless, Deann Groen; Christopher Hirsheimer (2007). Authentic Mexican: Regional Cooking from the Heart of Mexico. HarperCollins. p. 197. ISBN 978-0-06-137326-8. ↑ Ramos y Duarte, Féliz (1895). Diccionario de Mejicanismos. Imprenta de Eduardo Dublan. p. 98. Jeffrey M. Pilcher (2012). Planet Taco: A Global History of Mexican Food. Oxford University Press. pp. 46–47. ISBN 978-0-19-991158-5. Daniel D. Arreola (1 January 2010). Tejano South Texas: A Mexican American Cultural Province. University of Texas Press. pp. 174–175. ISBN 978-0-292-79314-9. Thomasina Miers (21 June 2012). Wahaca - Mexican Food at Home. Hodder & Stoughton. pp. 74–75. ISBN 978-1-4447-5692-0. ↑ Anand, Karen (2005). International Cooking With Karen Anand. Popular Prakashan. p. 28. ISBN 9788171549085. Prandoni, Anna; Zago, Fabio (2013). Los Sabores de la Cocina Tex-Mex (in Spanish). Parkstone International. ISBN 9788431555009. Armendariz Sanz, Jose Luis. Gastronomía y nutrición (in Spanish). Ediciones Paraninfo, S.A. p. 86. ISBN 9788497324403. ↑ Duggan, Tara (2001-04-29). "The Silver Torpedo". San Francisco Chronicle. Retrieved 24 April 2007. ↑ Feliz, Ramos y Duarte (1895). Diccionario de mejicanismos. University of Toronto: Mejico, Dublan. p. 98. 1 2 3 4 Morales, Eric César; Carrillo, Julián (2012). "Burritos". In Herrera-Sobek, Maria. Celebrating Latino Folklore. ABC-CLIO. pp. 178–180. ISBN 9780313343391. ↑ Keoke, Emory Dean; Kay Marie Porterfield (2002). "Snack foods". Encyclopedia of American Indian Contributions to the World: 15,000 Years of Inventions and Innovations. New York: Facts On File, Inc. p. 240. ISBN 9781438109909. 1 2 Christopher Cumo (30 June 2015). Foods that Changed History: How Foods Shaped Civilization from the Ancient World to the Present. ABC-CLIO. pp. 75–76. ISBN 978-1-4408-3537-7. 1 2 Roemer, John (1993-05-05). "Cylindrical God". SF Weekly. ↑ See, e.g., van Berkmoes, Ryan (2009). California Trips. Lonely Planet. ISBN 9781742203904. ↑ Smith, Andrew F. (2004). The Oxford Encyclopedia of Food and Drink in America. 1. Oxford University Press. p. 171. ISBN 0-19-515437-1. ↑ Smith, Andrew F. (2007). The Oxford Companion to American Food and Drink. Oxford University Press. p. 75. ISBN 0-19-530796-8. ↑ Franz, Carl; Lorena Havens (2006). The People's Guide to Mexico. Avalon Travel Publishing. p. 379. ISBN 1-56691-711-5. ↑ "What A Breakfast Burrito Will Do To Your Life". 2016-08-07. ↑ Addison, Bill (13 September 2006). "In search of the transcendent taqueria / Our critic puts 85 beloved Bay Area burrito joints to the test". San Francisco Chronicle. Retrieved 7 July 2015. ↑ Slodysko, Brian (2008-06-25). "Chipotle serves up free burritos and drinks". Lancaster Eagle-Gazette. Retrieved 28 June 2008. ↑ Hanson, Gayle M.B. (1996-12-02). "It's a Wrap! California offers America the next food craze". Insight on the News. Retrieved 25 April 2007. 1 2 3 4 Gustavo Arellano (16 April 2013). Taco USA: How Mexican Food Conquered America. Simon and Schuster. ISBN 978-1-4391-4862-4. ↑ Williams, Jack (1999-06-20). "Roberto Robledo, 70; made chain of Roberto's taco shops an institution". San Diego Union-Tribune. ↑ Sobel, Ben (25 September 2013). "Move Over, Ramen Burger: The French Fry-stuffed Burrito Is California's Secret Frankenfood". GQ. Conde Nast. Retrieved 28 May 2015. ↑ Gustavo Arellano (13 May 2011). "When Did the California Burrito Become the California Burrito?". OC Weekly. Retrieved 22 June 2011. ↑ Arellano, Gustavo (2010-06-17). "The California Challenge at Pepe's". OC Weekly. Retrieved 24 November 2010. ↑ Lee, Mike (13 July 2009). "Burritos aren't safe on their plate". San Diego Union-Tribune. Retrieved 10 January 2015. ↑ Hiss, Mark (2010-08-06). Frommer's San Diego 2011. p. 13. ISBN 9780470929162. ↑ Hauck-Lawson, Annie S. (1998). "When Food is the Voice: A Case Study of a Polish-American Woman". Journal for the study of food and society. Association for the Study of Food and Society. 2 (6): 23. doi:10.2752/152897998786690592. "Don Carlos Taco Shop". San Diego Magazine. San Diego Magazine Publishing Company: 67. 2000. Retrieved 10 January 2015. Lonely Planet; Ryan Ver Berkmoes; Alexis Averbuck; Andrew Bender; Alison Bing; Nate Cavalieri; Dominique Channell; Beth Kohn (1 October 2010). Lonely Planet California Trips. Lonely Planet. p. 105. ISBN 978-1-74220-390-4. Nile Cappello (22 July 2013). "California Burrito: Get To Know This Local Favorite". Huffington Post. Retrieved 10 January 2015. ↑ See for example: Berkmoes, Ryan; Sara Benson (2009). "California Iconic Trips: A Burrito Odyssey". California Trips. Lonely Planet. ISBN 1-74179-727-6. 1 2 3 Ian Pike (3 October 2012). 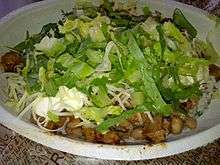 "The California Burrito, Part 1: Potatoes?". San Diego Reader. Retrieved 29 December 2012. ↑ Ryan, Richard (Winter 2003). "Is it border cuisine, or merely a case of NAFTA indigestion?". Journal for the Study of Food and Society. 6 (2): 21–30. doi:10.2752/152897903786769607. ↑ Wyer, Sarah C. (Fall 2014). "The San Diego Burrito". Digest. Chaplain College. 3 (2). Retrieved May 29, 2015. ↑ Carly Hanson (6 October 2011). "Finding USD's favorite burritos". USD Vista. Retrieved 28 December 2012. ↑ "San Diego Travel Guide". Travel Channel. Scripps Networks, LLC. ↑ Chad Deal. "Burrito Barato: Surfin' California at Lucha Libre". San Diego Reader. Retrieved 28 December 2012. ↑ Matt Hinton (5 May 2011). "10 great places to bite into a big burrito". USA Today. Retrieved 28 December 2012. ↑ Carolynn Carreno (November 10, 2004). "The Wrap that Ate L.A.". Los Angeles Times. Retrieved 17 January 2013. ↑ Weisbrod, Justin (2008-03-18). "Burritology 101: What lies beneath the tortilla". The Daily Aztec. Archived from the original on June 1, 2009. ↑ Kalk Derby, Samara (February 27, 2014). "Get Some Burritos offers "San Diego-style" burritos in Madison". Wisconsin State Journal. Retrieved May 29, 2015. ↑ Jonathan Gold (1 December 2000). Counter Intelligence: Where to Eat in the Real Los Angeles. St. Martin's Press. p. 34. ISBN 978-0-312-27634-8. 1 2 Jonathan Gold (22 Oct 2009). "What Is a Burrito? A Primer". LA Weekly. Retrieved 1 February 2013. ↑ Jonathan Gold (12 May 2009). "Ask Mr. Gold: Battle Burrito – L.A. vs. S.F.". LA Weekly. Retrieved 1 February 2013. ↑ Jonathan Gold (26 Jan 2006). "Old-School Bean & Cheese". LA Weekly. Retrieved 1 February 2013. ↑ "Lupe's #2". Chowhound. 19 Nov 2009. Retrieved 7 February 2013. ↑ Peter Schrag (1 December 2007). California: America's High-Stakes Experiment. University of California Press. p. 76. ISBN 978-0-520-93447-4. ↑ Jeffrey M. Pilcher (18 October 2012). Planet Taco: A Global History of Mexican Food. Oxford University Press. p. 144. ISBN 978-0-19-974006-2. 1 2 3 Javier Cabral (January 12, 2012). "9 Best Burritos in Los Angeles". Retrieved 28 January 2014. ↑ Grace Yek (January 23, 2014). "The Global Table: Red Sesame Food Truck brings flavors of BBQ, Korea & Mexico to the Tri-State". WCPO. Retrieved 28 January 2014. 1 2 Cathy Chaplin (17 December 2013). Food Lovers' Guide To® Los Angeles: The Best Restaurants, Markets & Local Culinary Offerings. Globe Pequot. p. 44. ISBN 978-0-7627-8112-6. ↑ Rebecca Lynne Tan (October 20, 2013). "Mex out on food - Mexican cuisine hits Singapore in a big way, with more eateries". The Sunday Times (Singapore). ↑ Palmatier, Robert Allen. (2000) Food: a dictionary of literal and nonliteral terms Greenwood Press. p. 372. ↑ "Our History | Beltline Bar". www.beltlinebar.com. Retrieved 2016-09-02. ↑ "Beltline Bar | Local First". www.localfirst.com. Retrieved 2016-09-02. ↑ "Grand Rapids Magazine : Online Feature June 2015". www.grmag.com. Retrieved 2016-09-02. ↑ Sen, Amit. (2005). Academic Dictionary of Cooking Isha Books. p. 84. ↑ Crosby, Olivia. (Fall, 2002). You're a What? Research Chef Archived December 26, 2007, at the Wayback Machine.. Occupational Outlook Quarterly. Vol. 46, Num. 3. ↑ Clinical Lipidology: A Companion to Braunwald's Heart Disease, Christie M. Ballantyne, ed. 2009. p.228. ↑ The University of Pennsylvania Health System. Breakfast, Dinner or Anytime Burrito. Adapted from the Cancer Nutrition Information, LLC. Archive URL: Mar 25, 2006. Aft, Lawrence S. (2000). Work Measurement and Methods Improvement. Wiley-IEEE. ISBN 0-471-37089-4. Ellman, Mark; Barbara Santos (2003). Maui Tacos Cookbook. Pendulum Publishing. ISBN 0-9652243-3-3. Fox, Peter (1998-07-02). "Burrito Search" (RealMedia). All Things Considered. National Public Radio. Fox, Peter (1998-07-17). "Burrito Odyssey" (RealMedia). All Things Considered. National Public Radio. Fox, Peter (1998-07-31). "Burrito" (RealMedia). All Things Considered. National Public Radio. Fox, Peter (1998-08-12). "Burrito Trail" (RealMedia). All Things Considered. National Public Radio. Fox, Peter (1998-09-03). "End of the Burrito Trail" (RealMedia). All Things Considered. National Public Radio. Fox, Peter (1998-11-04). "Burritos: A Search For Beginnings". Food. The Washington Post. pp. E.01. Gold, Jonathan (2000). Counter Intelligence: Where to Eat in the Real Los Angeles. Macmillan. ISBN 0-312-26723-1. Johnson, Lisa (2006). Mind Your X's and Y's: Satisfying the 10 Cravings of a New Generation of Consumers. Free Press. ISBN 0-7432-7750-3. Sparks, Pat; Barbara Swanson (1993). Tortillas!. Macmillan. ISBN 0-312-08912-0. Thomsen, David; Derek Wilson (1998). Burritos! Hot on the Trail of the Little Burro. Gibbs Smith Publishers. ISBN 0-87905-835-8. Young, Marc (2005-02-25). "Bringing the Burrito to Berlin". Culture & Lifestyle. Deutsche Welle. Retrieved 18 February 2008.